This afternoon, the popular language learning application Duolingo, received an update on Android that brings support for tablets. In addition, the app now also supports landscape mode across devices, so no more holding it in portrait to get your learning on. To top off the update, leaderboards have been introduced, allowing students aka players to rank up their language skills against their friends. 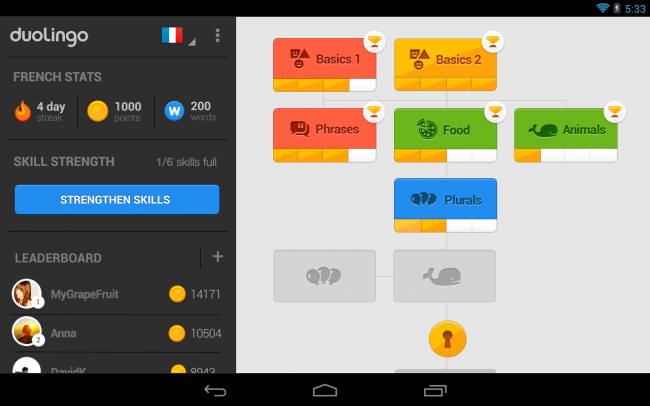 Tablet Optimized – Duolingo now supports the perfect device for learning! Leaderboards – Sure, it feels great to spend the day making progress in a new language; but it’s even better when you can leave your friends behind in the dust. Landscape Mode – Hold your device however you like, even Gangnam style. Awesome New Sidebar – With a single tap on the Duolingo logo you can now access your stats, see the leaderboard, and strengthen your skills. If you have a trip to a foreign country planned in the future and want to learn their language, trust me, this is a really fun and engaging app that could help.